Recycled Glass Rocks the Landscape! Tumbled, recycled glass (with no sharp edges) can be integrated into landscapes to create striking focal points. Imagine its use in fountains, fire-pits, fish ponds, pathways, mulch beds and gardens. Add color to beautify landscapes without the use of thirsty plants! From post-consumer bottles to post-industrial window scraps, recycled glass is available in a wide variety of colors and sizes for all sorts of applications. Since glass takes about 1000 years to decompose, recycling is an effective solution. It’s ideal in the landscape too, since it doesn’t fade or need replacing year after year. Plus, it’s a deterrent to garden pests, such as slugs, since they don’t like to crawl on it! Wow this is beautiful! I so love it! You can get recycled tumbled landscape glass in Ontario now! Visit our website and give us a call. Based in Southern Ontario. I love the landscaping. I live in austin, texas. where can I buy the blue sphere balls to go with my blue glass? Help us to get the word out about tumbled recycled glass for landscaping. We are in a drought in West Texas and people need to become aware that we can provide this glass. 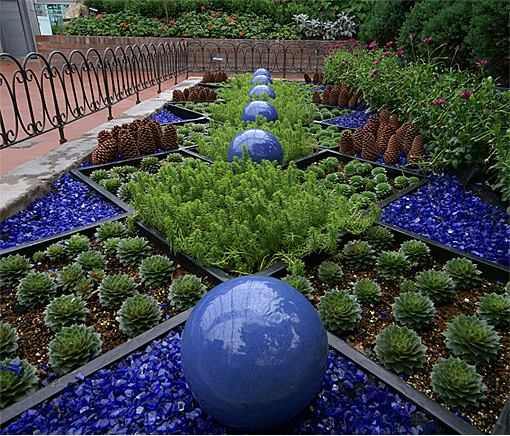 Where can I find the glass balls and blue glass mulch? I live Southern CA, any place you can recommend?